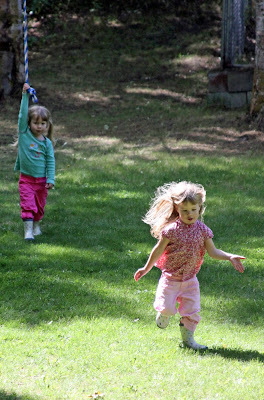 When we lived on a paved street with city water and cable TV, next to noisy neighbors and under bright streetlights, my two oldest daughters played in our backyard. It was the size of a postage stamp, but it was fenced and safe, with just enough space for a small swing set. Now that we live off a dirt road in the woods, my 11- and 9-year-old have no interest in venturing beyond the lawn. I guess they've been conditioned to stay close to the house. 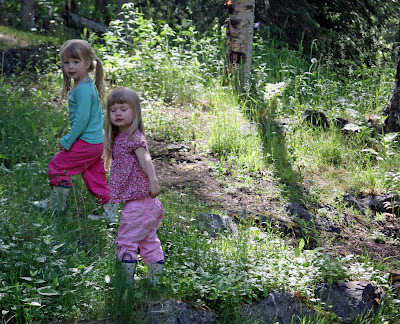 The twins, however, were only a few months old when we moved to our rambling home surrounded by birch trees. They don't know any other life. They chase each other through the tall grass and alders. They run up the hill into the woods. 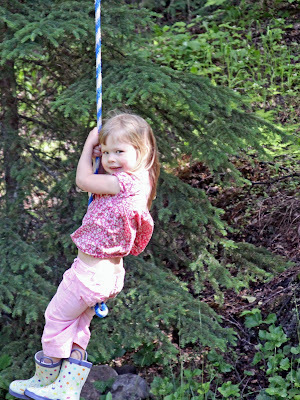 They grab the zip line and swing down into the backyard . . .
. . . without a care in the world. They are little backyardigans, aren't they? That zip line looks like so much fun! 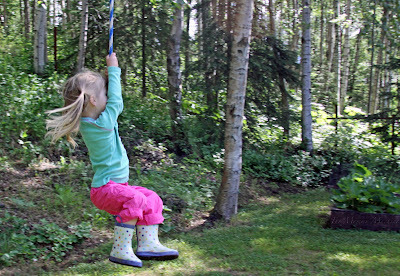 I wish we had a huge backyard for the kids to run around in...ours is decent size for our area but it lacks trees, bushes and flowers so it's pretty bare back there...nothing to discover except dead birds, dead mice (thanks to the cat) and snails. Awww, that zipline looks like so much fun! And they look like real nature girls (like their mom!). I love the title to this post. It makes me wonder, though. Why do you not think that you are funny? Your posts continually make me smile. I'll send you the response to your questions tomorrow morning! ooooh! Zipline! Makes me think of being a kid again!